Cane, Cob and Chimney Jewett are young Georgia sharecroppers held under the thumb of their domineering, God-struck father Pearl. When he dies unexpectedly, they set out on horseback to rob and loot their way to wealth and infamy, inspired by a lurid dime novel that only one of them can read. But little goes as planned and soon they’re pursued by both the authorities and by stories that make them out to be the most fearsome trio of bank robbers and murderers around. The truth, though, is far more complex than the legend. And the heaven they’ve imagined may in fact be worse than the hell they sought to escape. The Heavenly Table is gritty, electrifying and weirdly funny. 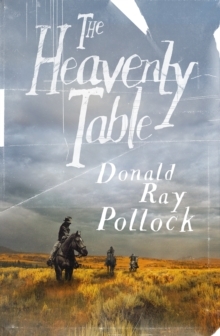 It cements Donald Ray Pollock’s place among America’s best contemporary novelists.